So once again Magic City, the Starz TV series set in Miami in 1959, called me to be the doorman of the Miramar Playa Hotel. On Saturday my call time was 5 p.m. After signing in I was sent to hair so they could cut and style my hair in the 1959 style. In the chair for a half an hour, the barber filled my hair with so much product, something that was like glue, that my hair was stiff and didn't move. But was that enough? No! Next he sprayed the whole head with hair spray to make sure that nothing would ever move. The funny thing was that for my part as a doorman I wore a hat so most of my head was covered. Did that matter? No! What if they ask you to take off your hat? The barber said he had to make sure my hair was in the correct style no matter what. Next I went to wardrobe. 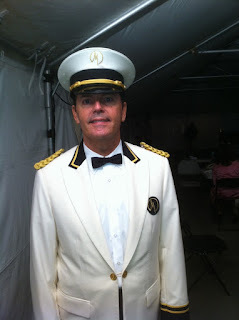 They gave me my doorman outfit, the same that I had worn the last time. After I was dressed another wardrobe person told me I had the wrong costume on. I was wearing the day costume instead of the night costume so I was pulled back into wardrobe to be redressed for night as this was to be a night scene. I waited until he dressed two other cast members and then he had me undress in a fitting room. Then he realized that all I needed was a new jacket and bowtie (instead of long tie). The costume change took another half an hour. It was nearly 7 p.m. so I couldn't understand why everyone was working so slowly. Next I was sent to makeup where I got new eyebrows and a coat of powder. Again, like the barber, the makeup artist took care with making up my forehead and hairline, the area that would be covered by my hat. This time I didn't question and just let him do his job. Since we weren't being called to work I went in the tent where all the actors waited. For the most part they were reading or chatting. I always bring reading material so I was content reading. At 8 p.m. They brought coffee and snacks. Not a good sign I thought. I started texting friends. At 9 p.m. We were still waiting. At 10 p.m. We were taken to the set for a rehearsal. Today the scene was between Jeffrey Dean Morgan, who plays Ike the head of the hotel, and his son played by Christian Cooke. The beautiful actress Kelly Lynch, who plays Meg Bannock in the show, was not in the scene but showed up to watch. Also on the set was Mitch Glazer, the creator and executive producer of the show who is from Miami Beach, was also there to oversee everything. Everyone was positioned and I took my place by the door. Today I had to open the door for Christian Cooke as he ran out of the hotel with two suitcases. Later in the scene he... well I guess you should watch the show to find out. Anyway, we rehearsed the scene several times and then broke for dinner. We had a lovely Mexican meal, chicken, shrimp, tacos, salad, etc. After lunch, we headed back to the set and waited for everything to be set. As usual, every detail is attended. I had my shirt re-tucked in by a wardrobe person and hair tried to fix the back of my hair but it was too stiff to change. Cocktails, cigarettes (fake ones that smell awful), period eyewear, and other accessories were passed out. And right before filming was to start and AD (Assistant Director) came over and told me that it was Mitch Gazer's birthday and a cake would be coming out and I would be signaled to open the door. The cake was brought out, a beautiful chocolate creation, the cast and crew sang "happy birthday" and Mitch made a speech. After a brief break, filming began again. The scene was shot repeatedly and involved three cars, one being a taxi. After the sixth take the taxi conked out and wouldn't start so the scene was shot several times without a taxi. Finally at about 1 a.m. or so, the scene was finished, from that angle but they were turning the camera around. That meant the camera would be on the car and not the hotel so everyone in the hotel was not needed. We were sent back to the tent to wait until that needed us for another scene. We waited and finally at 2:30 a.m. they cut us and told us we'd come back another day to finish the scene. I made it home well after 3 a.m., more exhausted than if I had actually worked as a hotel doorman. Oh, the glamorous life of working on a TV show.